Killing rivers could kill livelihoods. (Panos) – Illegal river poisoning and run-off from coffee farms seem to be posing a serious threat to the health of rivers in the eastern Jamaica parish of StThomas as well as general public health in the area. Environmental groups such as the St. Thomas Environmental Protection Association, STEPA, are raising concerns that coffee farming, one of the major economic activities undertaken in St. Thomas , is severely polluting that parishs rivers which provide a significant amount of domestic water supply for the rural parish (long known for chronic water shortage). Illegal river poisoning as a method of harvesting fish which is practiced by some residents, has also been noted for polluting the water sources, posing a severe threat to fish stock and public health. Terrence Cover, president of the St. Thomas Environmental Protection Association, STEPA, said the current National Bio-diversity Strategy and Action Plan which outlines strategies for the monitoring of rivers and coastal areas, makes very little mention of the protection of the islands rivers. There is not much study done on rivers, and so no single agency is responsible for the protection of (rivers) and so the rivers are losing their fish life, he said, adding that due to its geographical location; St. Thomas has the islands largest concentration of hillside farming including large coffee farms. Waste from the hillside, fertilizers and so forth, seep into the waterway, he said. He was however, even more concerned about the direct injecting of poison into the rivers by residents as they try to do mass harvesting of shell fish or other fresh water fish for personal consumption or sale to hotels and restaurants or to make soup for sale to the public. He told Panos Caribbean that people from the parish have been hospitalized due to fish poisoning as a result of consuming the contaminated fish. Mr. Cover was one of several civil society representatives attending a meeting with representatives of the International Union for Conservation of Nature, IUCN, a global environmental network based in Geneva , Switzerland . The team, headed by IUCNs Deputy Director, Dr. William Jackson, discussed the Union s Caribbean Initiative, a programme aimed at greater cohesiveness and effectiveness in tackling the regions environmental challenges. The team met with government representatives and Jamaican civil society during a recent two-day visit to the island. The initiative, which will be part of a new global programme of the IUCN, will be finalized and adopted at the World Conservation Congress to be held in Barcelona , Spain , in October 2008. Noting that that St. Thomas has a lot of rivers, Mr. Cover said fishing was both an economic and recreational activity there and unless the issue was addressed urgently, the threat to livelihood and food security both in the parish and more broadly, would escalate. He also fears irreparable damage to the rivers bio-diversity from the frequent poisoning. The concern is not exclusive to cover and is also being addressed at different levels. For example, the United Nations Caribbean Environment Programme, is working to raise awareness on the dangers of polluting the regions water sources. Under its Assessment and Management of Environmental Pollution programme, the UN body also builds capacity of communities and agencies to reduce this harmful practice. Other organizations such as the local environment agency, The Nature Conservancy, is also working on addressing river poisoning (also a problem in the Rio Grande Valley of Portland). In fact The Nature Conservancy (TNC), received international funding of about US$15,000 to work in the Rio Grande Valley , where River poisoning has been persistent for the past six years. TNCs programme includes a public education campaign, aimed at making local people aware of how dangerous and illegal the practice is. Kimberly John, manager of the Sustainable Waters Program for The Nature Conservancy said other activities under the programme include the specialized training of more than 20 honorary River Wardens in environmental management, law and compliance as well as enforcement issues. The wardens can arrest persons caught poisoning the rivers in the Rio Grande Valley . Law enforcement personnel and judges also received training in order to help them recognize, effectively prosecute and appropriately punish offenders. Previously the enforcement officers did not know what to charge offenders for, the correct ways of collecting evidence and how to present their case in court, Ms. John stated. 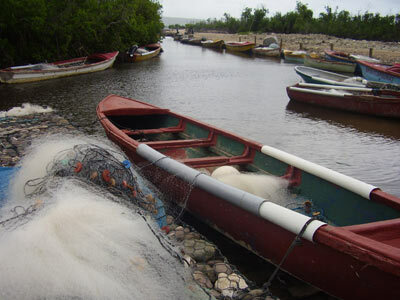 Fishermen are also being encouraged to return to traditional fishing methods such as using fishing pots, line fishing and nets instead of harmful poisoning. The project began in 2007 and should finish in June 2009. Additionally, the Jamaican Ministry of Health has also recognized that the islands water sources are severely polluted and report that more than half the water sources in the island (sea and rivers) that were tested in the first three months of 2008, had high levels of bacteria or pollutant in them. Leonard Smith, Environmental Engineer at the Ministry of Health, supervises the laboratory where the water samples are tested. Up to 55 percent of the samples this year were poor, he said, when asked about the extent to which the islands water sources were polluted. However, he said industrial waste as well as effluent and other waste from squatter settlements also contribute to the problem. UNEP estimates that approximately 40,000 cases of gastroenteritis is reported in the region each year and Mr. Smith lists gastro-intestinal illness, rashes and ear infections as the key health problems that affects Jamaicans due to poor water quality from polluted water sources. Mr. Cover says a number of workshops on the dangers of polluting rivers have been held in his community. However, he is concerned that enough is not being done by law enforcement to prosecute people who continue to harm the environment by putting poison in the rivers in St. Thomas as well as those who own farms who do not take steps to reduce the chemical run-offs from their farms. The use of organic fertilizers is one environmentally friendly option that is recommended instead of the chemical fertilizers that are widely used. He would also like to see more public awareness, education and training on the issue within the parish. He was not immediately optimistic that the IUCN Caribbean Environment Initiative will help to address the river pollution issue that, to him, is an urgent matter. But he indicated that he would be doing further research to see how the initiative can be meaningful to residents of St. Thomas in saving the parishs fish stock, safe guarding public health and preserving an activity that has both economic and cultural significance to the sparsely populated parish which sits on eastern tip of the island and is often forgotten.